Here’s a fast, easy, fun way to help employees get valuable insights into understanding differing personality types. Great for seminars and in-house training, this powerful personality type assessment tool is also highly effective as a team building activity. Encourages people to find out how to work in harmony with another management style. Provides participants with a self improvement tool they can use at work and with family and friends to increase self confidence and personal power. Role plays and other materials in the Trainer's Manual help underscore the need for understanding different personality type profiles. It includes program agendas, structured experiences, and complete instructions for administering the training as part of a leadership development and management development program. Each Participant's Package includes the process wheel, profile sheets, and a handy booklet filled with tips on using the principles of personality type. A 21-slide PowerPoint is excellent for use in conducting a training or giving a presentation to management on the benefits of employees understanding and using psychological type. 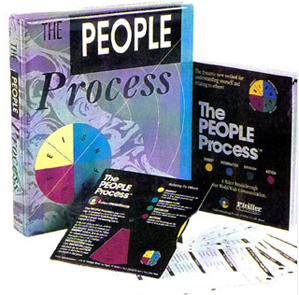 Identify management styles quickly and easily with The PEOPLE Process® Wheel ... A colorful tool that makes the whole process FUN! Are you ISTJ? ENFP? Now you can tell in 5 minutes with this user-friendly personality type profile indicator!